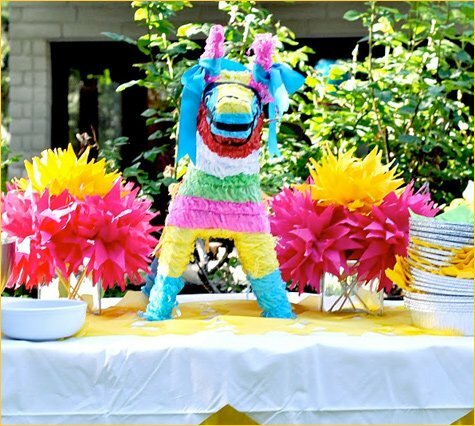 “We used my fortieth birthday as the excuse to host a party we’d been thinking about for a few years, with street taco vending, live Mexican music, good friends and family and lots of bright decorations. Here is the report on my FIESTA FORTY! starting with a photo of my little Scarlett in her fiesta skirt and blouse and me in my maternity Mexican peasant blouse–hooray for variety in pregnancy wear! It was fun to dress the part for this party. As you can see, I jumped on the tissue paper pom-pom bandwagon for this party. Loved the idea of brightly colored clusters of these hanging from the trees. I used a mixture of rounded and pointed petal poms in bright pink, turquoise, yellow, white and orange. 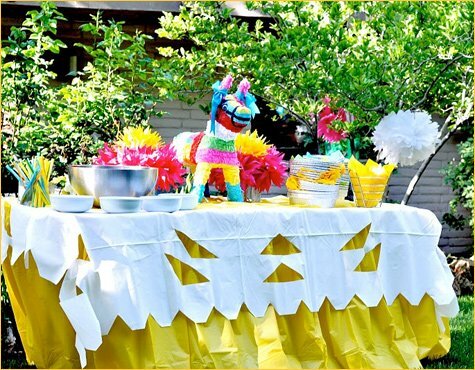 We set up guest tables in our backyard topped with chartreuse green table covers, then yellow paper cloths hand-cut to resemble Papel Picado banners, then my oilcloth Fiesta Tablecloths, and finally the Fiesta Flower Bouquets I had been making in the wee hours these past weeks. So fun to see these ideas come together! 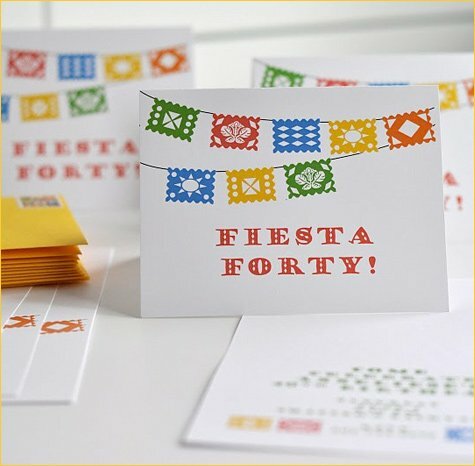 I typically don’t like using paper but it seemed the right thing for this casual fiesta–plus I love the Mexican paper crafting traditions of banners, flowers and tissue covered pinatas. 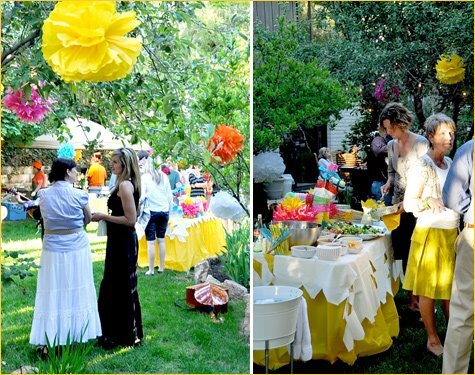 The serving tables were set with yellow table skirts, white hand-cut paper tablecloths, and over sized yellow tissue Papel Picado banners. I wish I’d taken better photos of the banners because they turned out really fun and were a big part of the original concept for this party, including the invitations (pictured at top). I used a different variety of paper flower bouquets on the serving tables. It was so much fun iterating on this theme! On one table I had over-sized arrangements with a mix of rounded and pointy “blooms” in 36″ tall vases. (See image #1 at the very top.) I used paper dinner napkins to make these blooms and long dowels purchased at a craft store. 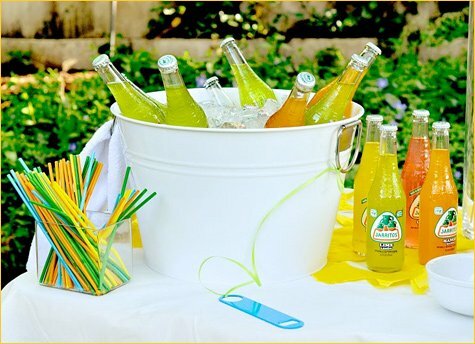 Other serving table details included delicious Jarritos sodas in lime, mandarin, mango, guava and mandarin. These are good and so sweet so one needs a party as an excuse to drink them! We also served “Mexican Coke” (the stuff made with cane sugar instead of corn syrup–yum!) but the Jarritos were the first to go! I found some bright turquoise metal bottle openers at a local restaurant supply and tied them to the drink coolers. But the food is the real story! 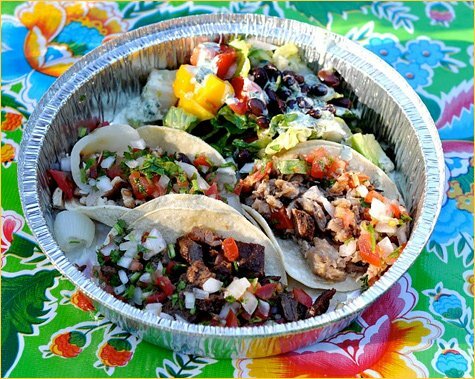 It was the real deal: carnitas, carne asada and pollo street tacos with grilled onions and pico de gallo (catered by a great local authentic restaurant); chips, my husband’s guacamole and a variety of salsas; my Fiesta Salad; and churros made-to-order (the only way to eat them!) with chocolate or sweetened condensed milk to top. 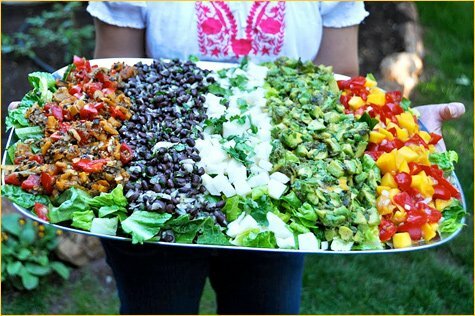 I loved the idea of the guests ordering just what they wanted and moving around from the taco tent to the serving tables while visiting with each other. It worked perfectly! So much fun! And, of course… the birthday cake! I made Tres Leches Cake, four of them actually (recipe here). 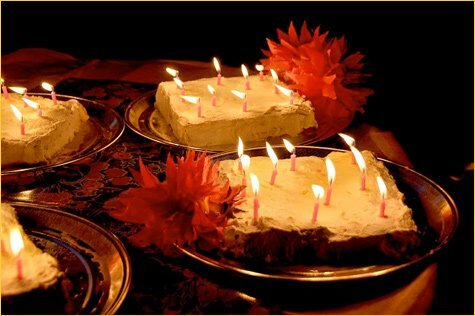 I topped each with a bright pink flower and ten candles… a bit less overwhelming to spread them out in tens rather than have forty on one cake! 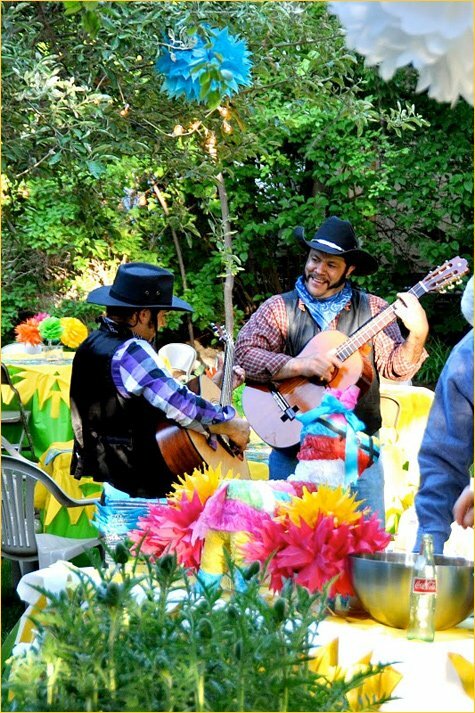 We had two guitarists playing Ranchero music. 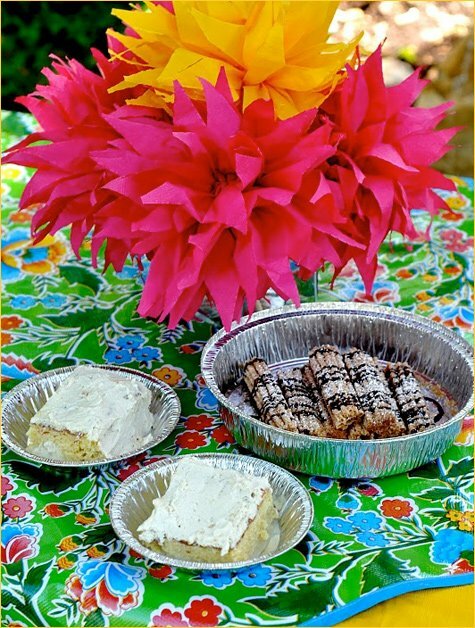 They were so great – played a good variety at the right volume and really added to the fiesta flavor! It wouldn’t have been a party without the people. I love the chance to bring together family and friends from different stages in my life. I was lucky to have friends at the party from high school in addition to those I’ve made more recently. I love it! 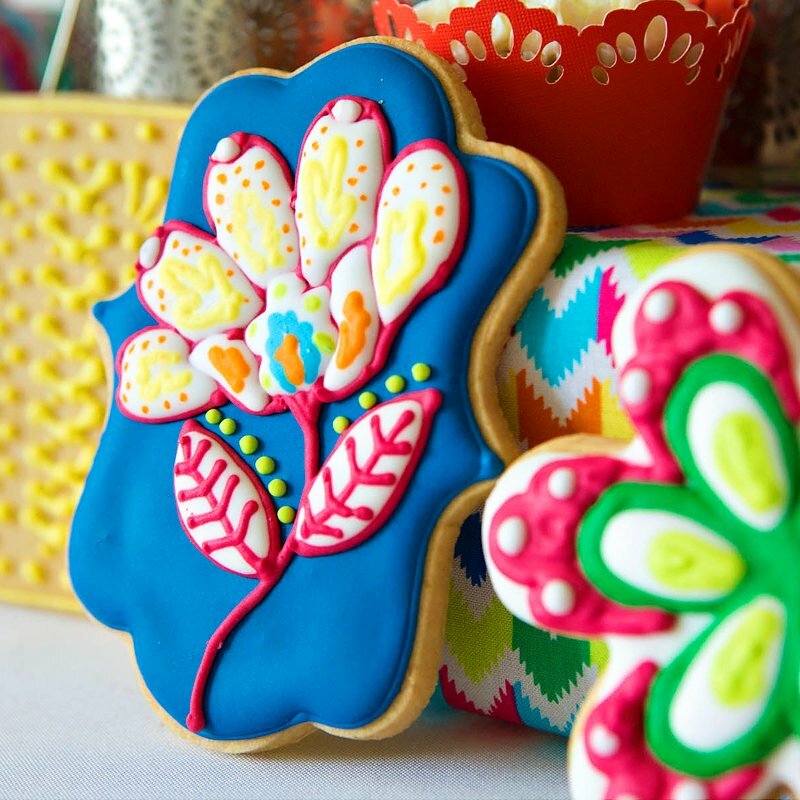 I just made a suggestion early this week about wanting ideas for a Fiesta!Great inspiration! Wow! I had fun just looking at the photos! Love the bright bold colors! The food looks amazing! I’m hungry. love it nice and colorful! I really love this!! The poms are amazing – I love how they are put in vases as the centerpieces on the table…. 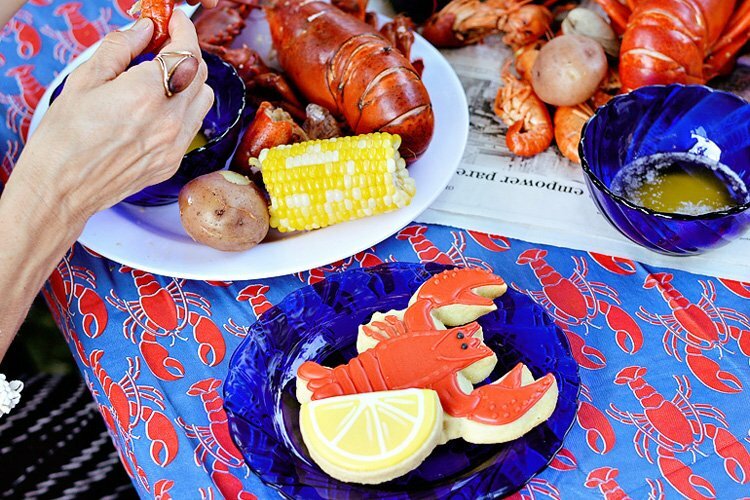 and the food – I am drooling! what a great party-looks like so much fun! 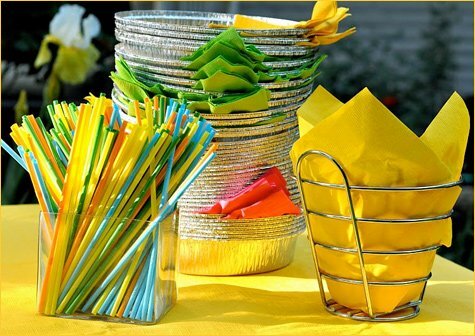 I love the bright colors and theme! Very nice, I love to see different adult party ideas. Wish there were more to see. I love the pom poms!!! wait.. I love it ALL! AWESOME!! 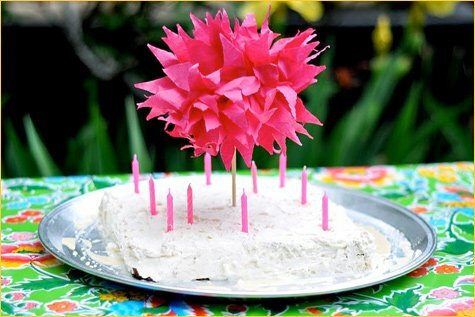 I’m doing an “Adios Dos” birthday party for my soon to be 3 year old.. can’t wait to use some of these ideas! Everything looks beautiful and festive! Paper pom-poms are my favorite, they liven up any event. The food looks delicious! I also love the detail of using the aluminum “to go” tins as plates! What an easy idea (with quick clean-up). 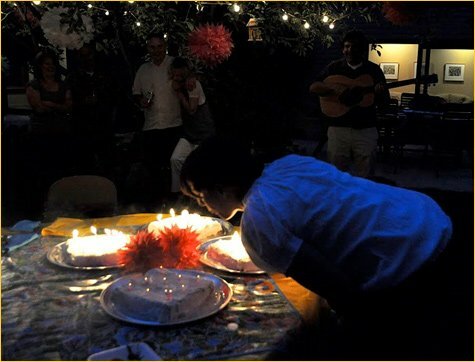 I’m mexican and really know about our traditions and how we throw parties… and when I saw your photos… It makes me a big smile, really!!! everything looks so fresh and vibrant!!! 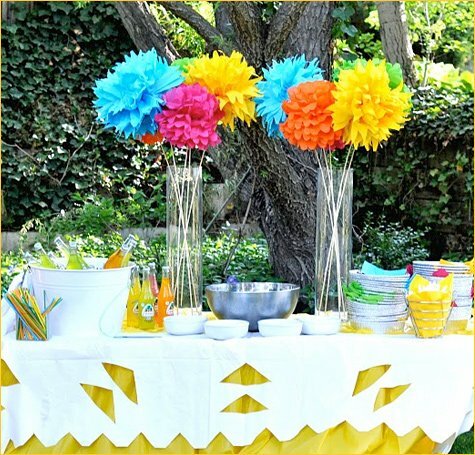 Genius to put the pom poms on the sticks — I was recently brainstorming for a way to use the tissue paper pom poms at a venue where we couldn’t hang anything. This is the perfect solution. I love this idea! ANyone have any idea where I can purchase those vases? The holes in the top are fantastic! 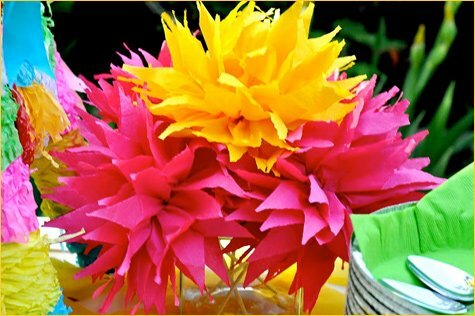 Love the colorful paper flowers! You are amazing. I am utterly inspired. I want to have a fiesta NOW! I want to use these ideas for a Bible Study I do with 8th grade girls. Thank you! I have been searching for the vases with the metal top with holes–any websites that sell them or something similar? I would love them for large lollipops for a baby shower. Thanks! This page, actually this whole site, is so inspiring. 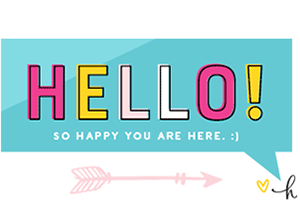 what wonderful entertaning resource full of exciting and original ideas that won’t break the bank either. I love it. 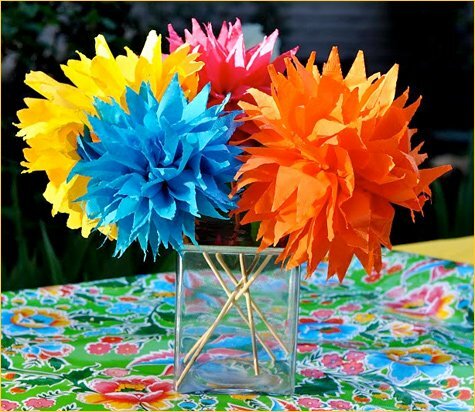 I love the paper pom-pom centerpieces…absolutely fabulous idea! 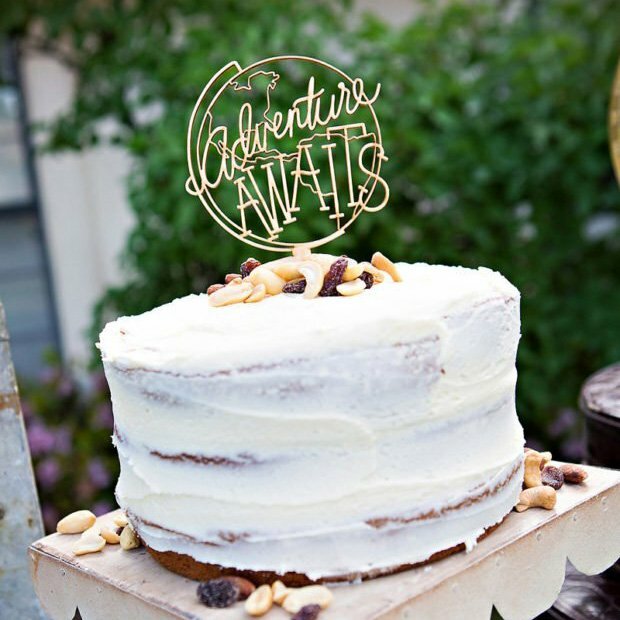 Where can I find invitations like those? 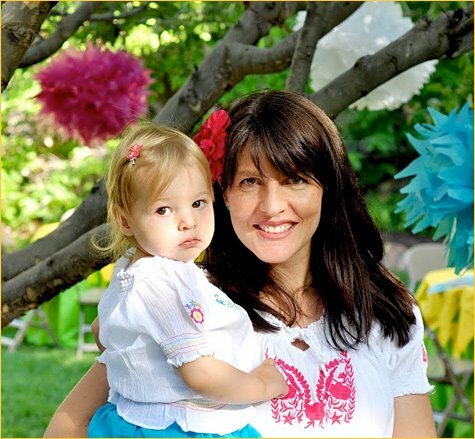 I am planning my daughter’s 1st b-day and we have a photo session scheduled where she’ll wear a white Mexican cotton dress and I would love to be able to incorporate her picture with the invite. Great party! I am doing a fiesta for my Daughters 1st birthday! How did you attach the dowles to the pom poms? Any changes you have a source for those aluminum take-out containers? 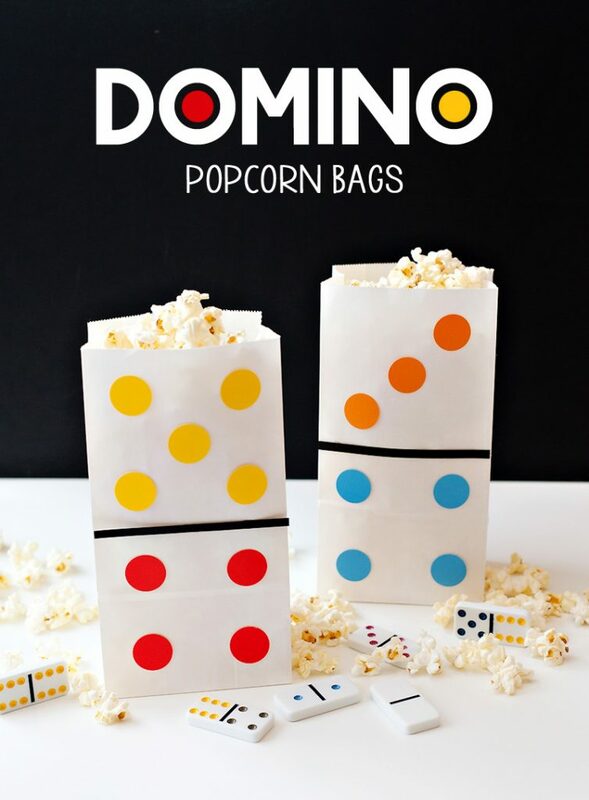 I LOVE the idea but I can only find them in quantities of 500!! 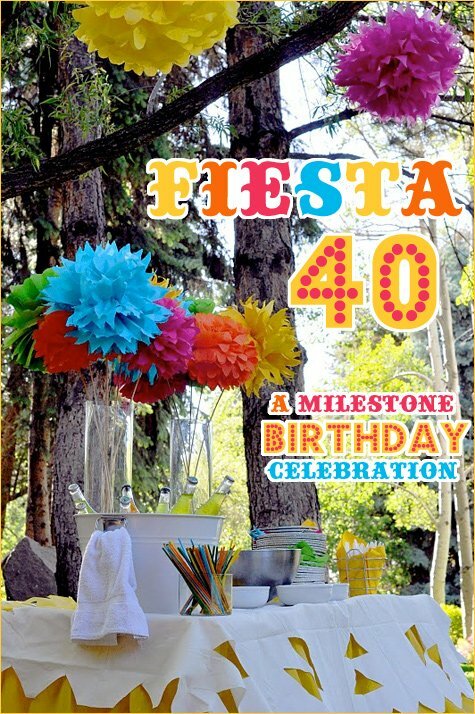 Where can I order the “Fiesta 40” signs? Great decorations! 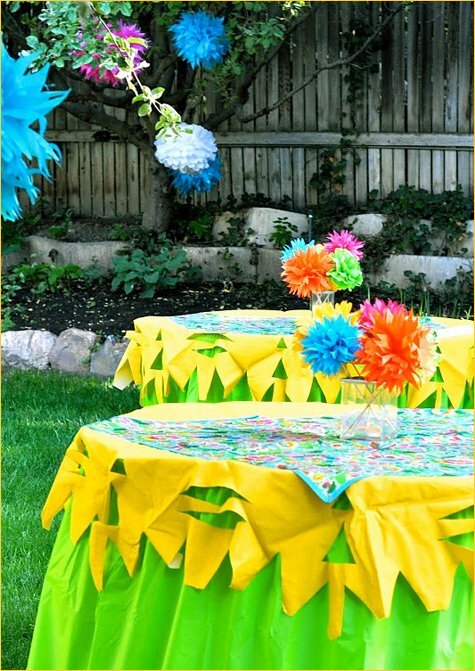 I love the tissue paper pom poms as a centerpiece. So creative and so simple at the same time! I LOVE these!!! Can you tell me how you attached the sticks at the end of the pom pom flowers? I am having a giant party and this is EXACTLY what I need! 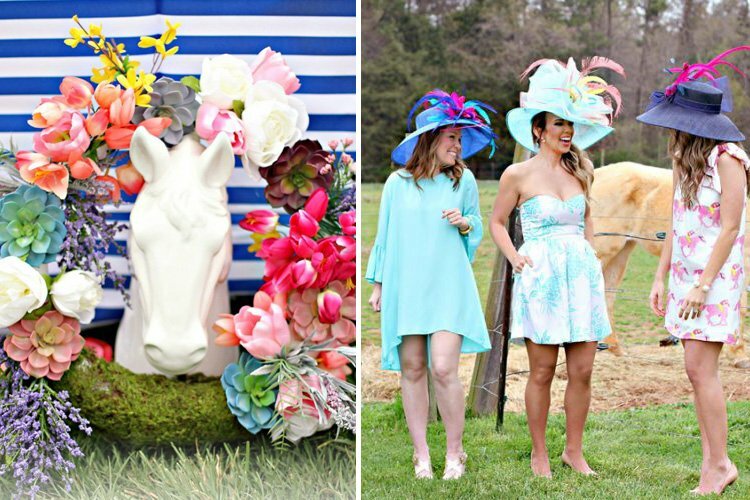 They are gorgeous and so fun! But I need to figure out how to get them to stand up straight at the end of the stick!! Thanks!